Before anything else, I want to thank you for all your comments and get-well-wishes. It actually helps! I am slowly getting better and better, and hope to be back on full speed again in a month or two. 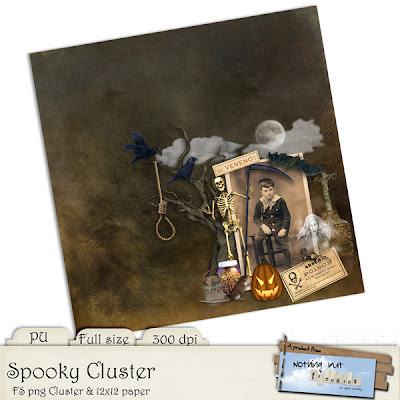 I have decided to be a little ahead of time with the seasonal items, so here is my first Halloween freebie - more will follow. This one was created as a "get in the mood" play session and ended up good enough to be given away. I am not quite sure what you can use it for, but I'm sure you'll figure something out. I hope you like it. You get 1 png cluster and 1 cluster paper. NOW also as frame - GO HERE. awesome! thank you! I love Halloween well the whole of all really! I'm glad you're feeling better - just don't overdo! Thank you so much for this post. I want to let you know that I posted a link to your blog in CBH Digital Scrapbooking Freebies (please, notice the new url for my blog), under the Page 9 post on Sep. 11, 2012. Thanks again. I love the cluster. Do you have it without the pic of the boy in it?